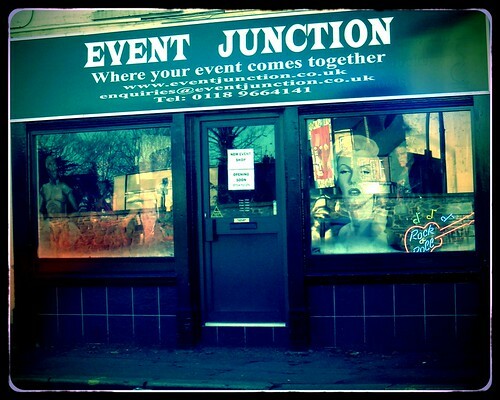 Colourful costumes adorn the window of ‘Event Junction’. C3PO, Marilyn Monroe and more. I walk by several times a day. It always brings a smile to my face. Cemetery junction is a lively community hub and a traffic nightmare. This store compliments the diversity of the area and starts you dreaming of possibilities and happy events. It reminds me of the 70’s children TV program “Mr Benn“. It’s a pleasant diversion from the other local, numerous, convenience and fast food stores. At the moment I’m trying to pluck up the courage to go in and try on the costumes… find my own adventure. Just seeing the shop makes my day. This scribble was published on Friday, December 7th, 2012. You can follow any banter on this scribble with the RSS 2.0 feed. You can share your inspired musings after typing the anti spam word near the bottom of the page. But no Pinging because its too naughty. Oh go on in there! I just know you would make a good Marilyn Monroe! Yes! And I hope you get to keep that unexpected item after, “to help you remember”. I wish there were more opportunities to dress up…. I might get away with a milk maid outfit on a regular basis.